You may wish to see an introductory page to this section or to Cappadocia first. 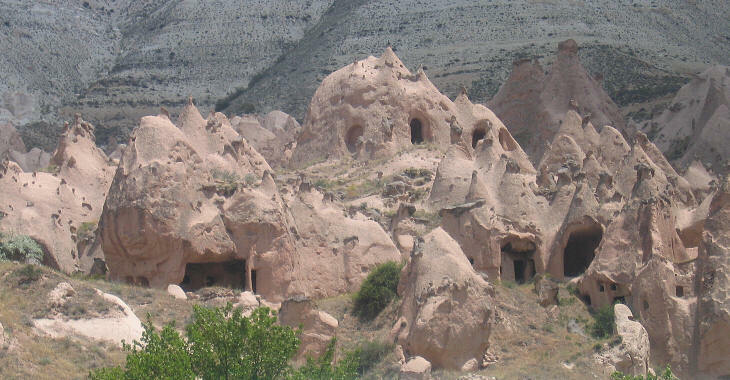 Cavusin (or Cavus'in) is a small village on the road linking Goreme with the town of Avanos. Until the 1920s it had a mixed population with many Christian Orthodox families. 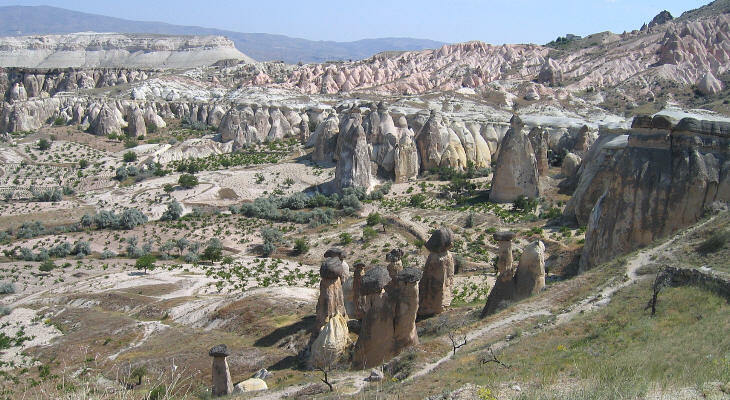 While the walk from Goreme to Uchisar goes along narrow paths, that to Cavusin takes place in a valley which becomes gradually wider. This allows extended farming. The inhabitants of Cavusin lived in houses which were cut into a long rock wall. A winding narrow path reached the top of the village. The Christians living in Cavusin prayed in an old church near the top of the village. It had three entrances leading to three almost separated naves. The framed doors and windows of two naves are still in place while the rock closing the third nave has collapsed. Today a shaky footbridge is the only access to the church. The interior of the church has elaborate mouldings, columns and arches as well as reliefs showing crosses and stars. Their style has points in common with Syrian Christian architecture rather than with the Byzantine one. Few people venture to visit the church and the access is not subject to any kind of control. Although the site is unlikely to pay for a warden, the Turkish Ministry of Culture ought to do something more to preserve this interesting monument. A second historical church is located outside Cavusin and it is properly maintained. It was founded by Nikephoros (Nikephoros = bringing victory) Phocas II, a Byzantine general who was born in Cappadocia. He managed to defeat the Arabs and to retake Crete in 961. He became emperor (to be more precise co-emperor) in 963 by marrying the young widow of Emperor Romanos II. Early in his life he had been married and after the death of his first wife he took an oath of chastity. Apparently he kept his oath even after marrying the empress. A few years later she took as her lover a nephew of Nikephoros; the two plotted to assassinate the emperor who was killed in his own bed chamber. 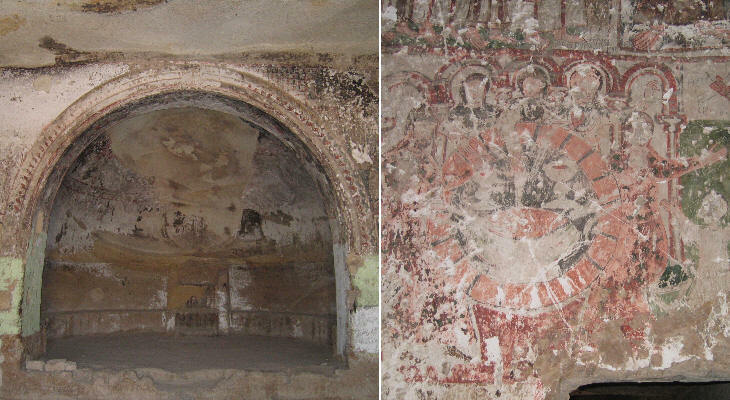 The frescoes inside the church portray elongated figures of saints and angels in the upper part of the walls. They are dressed in a traditional way. In the lower part of the walls other saints wear the elaborate silk costumes of the Byzantine court. It is worthwhile reaching the top of the rock wall to see the valley behind it; in the distance one can see the pink pinnacles of Zelve and in the foreground a group of spectacular "fairy chimneys". Until the 1920s Zelve was a mainly Christian village. Its inhabitants lived in houses which were cut into a group of pink rocks. In the 1950s it was abandoned by its Muslim population too. Avanos is a small town with a very long history: Zwinasa, the original Hittite name became Roman Venasa, then Byzantine Vanota and today's Avanos. The continuity of the settlement is due to its location on the right bank of the River Kizilirmak. This is the longest river which entirely flows within the border of the Republic of Turkey. It rises in the mountains of eastern Anatolia and it heads towards the Tuz Golu, the large salted lake at the centre of the tableland. A few miles away from the lake it turns north and it finds a difficult passage through the coastal range until it reaches the Black Sea to the east of Sinop. Avanos is known for its pottery which makes use of the river red clay. 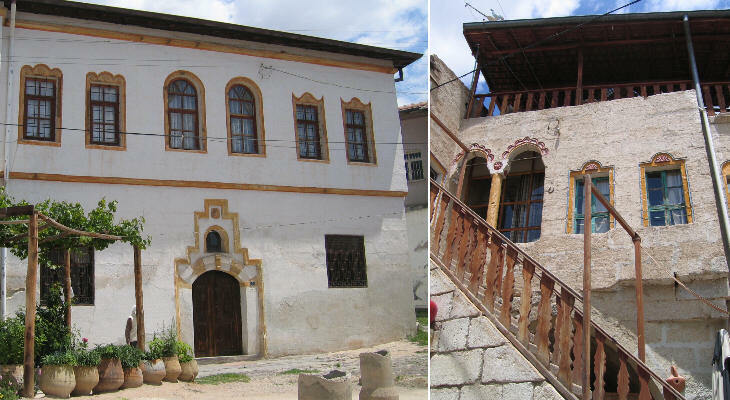 Its old quarter retains some interesting traditional Ottoman houses. 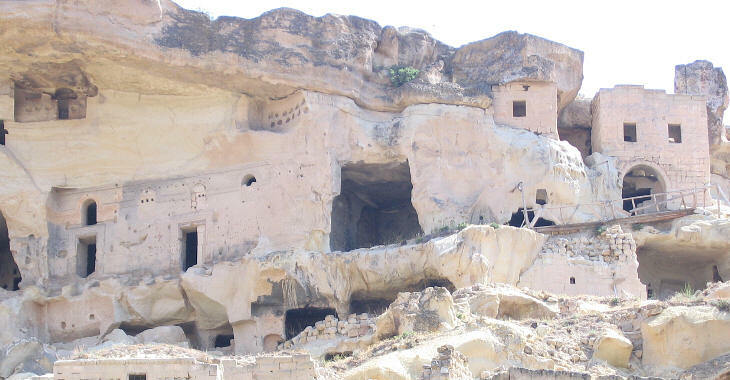 Urgup is a town with many large hotels owing to its location which is within easy reach of Goreme, Uchisar and the other main attractions of Cappadocia. Visitors are offered the opportunity to enjoy a bath in a historical hammam, which turns out not to be an Ottoman building, but a former Christian Orthodox church which was built in 1900. At the beginning of the XXth century the Christian community of Urgup was rather wealthy; in addition to the small church near the main square they built a larger one at the entrance of the town. It was in part cut into the rock; its interior had a rich decoration. Currently a wall hides it and there are no indications about its name and history. In order to find it you need to travel by bus. It is on the left side of the road from Nevsehir to Urgup.